Henninger-Warner Marriage (1840)Thomas D Warner was born on 19 Jun 18141 in Sunbury, Northumberland, Pennsylvania.2 Currently his parents and siblings are unknown even though there were multiple Warner families from Northumberland County (Birth date was obtained by counting backwards using information provided by the headstone at his gravesite). 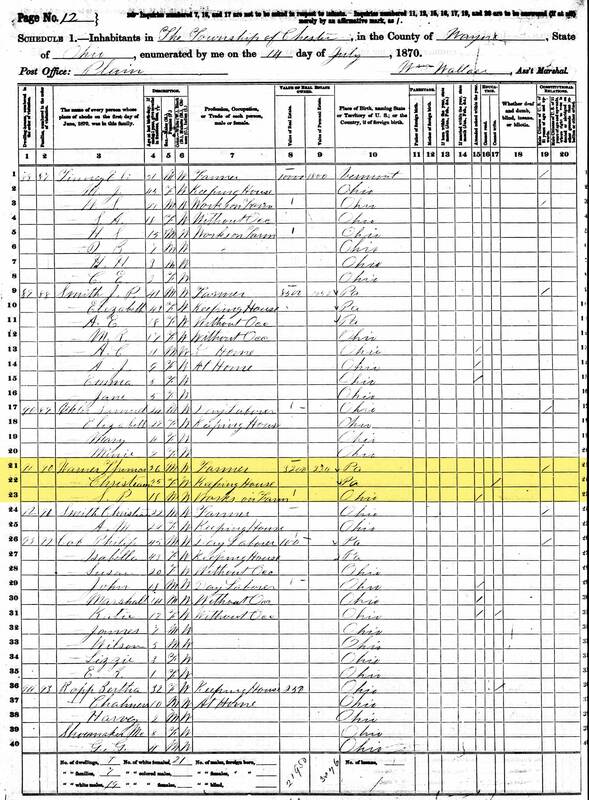 1850 Census for Warner FamilyChristina Anna Henninger was born on 06 Mar 18153 in Augustaville, Rockefeller Township, Northumberland County, Pennsylvania to parents Phillip Henninger and Magdalena Dunkelberger. Here Christina was baptized on 11 Jun 1815 at Zion (or Stone) Lutheran and Reformed Church, sponsored by John Ried and his wife. Thomas died on 03 Apr 1879 in Chester, Wayne, Ohio.1 For whatever reason, burial records state he wasn't buried at the Overton Church Cemetery until 19 Feb 1889. I have yet to discover the reason for this massive gap in the records, however, Thomas now rests with his wife Christina. Magdalena Hauer Dunkelberger, 1780 - ? A Christina's father. 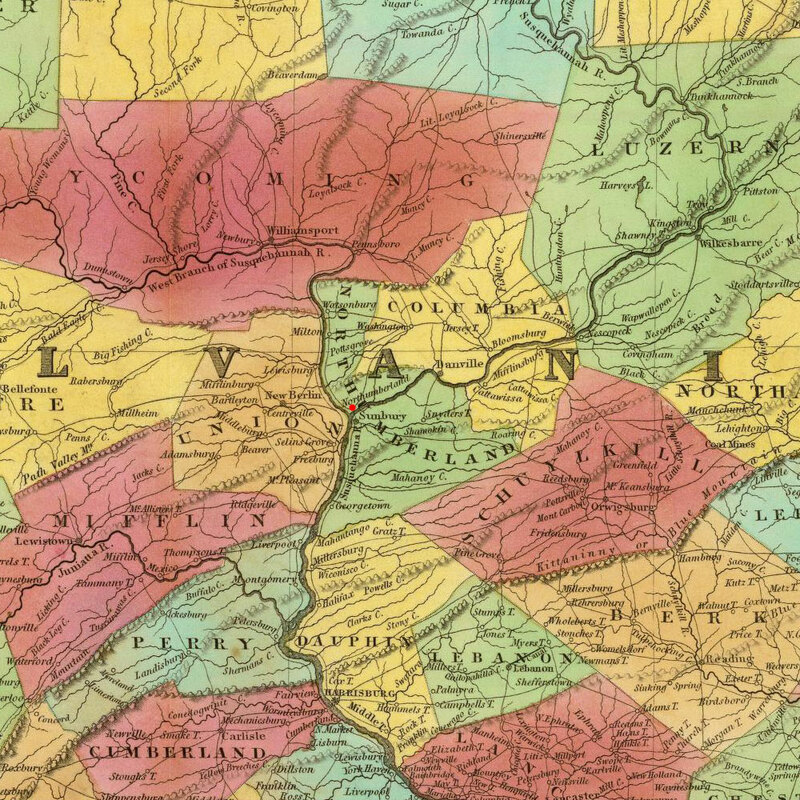 Phillip, was said to be of Augusta, Northumberland County. Whether this is true and whether or not he lived there when Christina was born, I am unsure. B Sunbury and Augustaville are only 6 miles apart; Sunbury to the north and Augustaville, a bit southeast. There is a town named Dunkelbergers (same as Christina's mother Magdalena Dunkelberger) about 3 miles south of Augustaville. 1 Headstone of Thomas Warner, 1814-1879; Overton Church of God Cemetery; Chester Township, Wayne County, Ohio; Thomas Warner; Standing in the road the grave is left of the church, close to church & road. 2 Ohio Death Record for Simon Peter Warner; "Ohio, Deaths, 1908-1953," index and images, FamilySearch (https://familysearch.org/pal:/MM9.1.1/X6W2-DVV : accessed 18 Jan 2014), Simon Peter Warner, 06 Sep 1935; citing Lodi, Medina, Ohio, reference fn 55981; FHL microfilm 2022526. 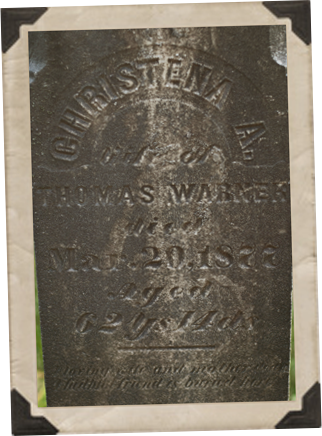 3 Headstone of Christina Warner, 1814-1879; Overton Church of God Cemetery; Chester Township, Wayne County, Ohio; Christena A. Warner; Standing in the road the grave is left of the church, close to church & road. 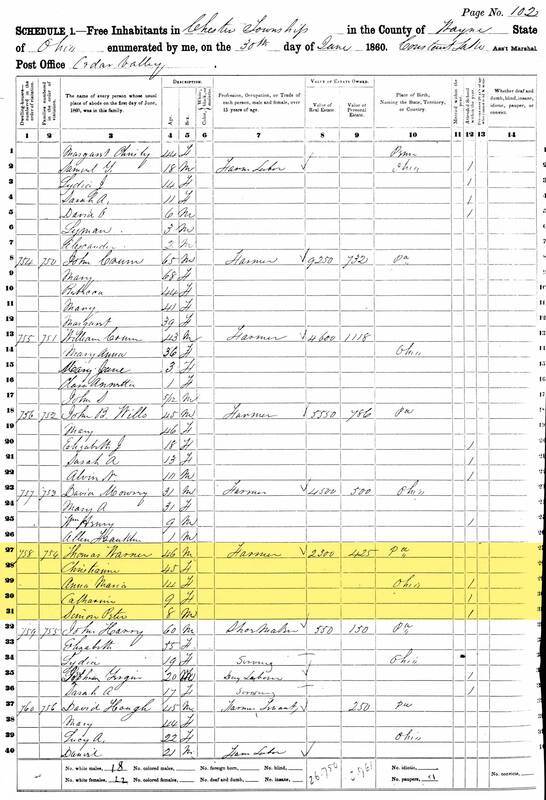 4 1830 United States Federal Census about Philip Heninger; 1830 US Census; Census Place: Canaan, Wayne, Ohio; Page: 117; NARA Series: M19; Roll Number: 142; Family History Film: 0337953. 5 Ohio Marriage Record for Thomas Warner & Christina Henninger; "Ohio, County Marriages, 1789-1994," index and images, FamilySearch (https://familysearch.org/pal:/MM9.1.1/XZDJ-LP1 : accessed 18 Jan 2014), Thomas Warner and Christina Heninger, 13 Feb 1840; citing Wayne, Ohio, United States, reference 337; FHL microfilm 425754. 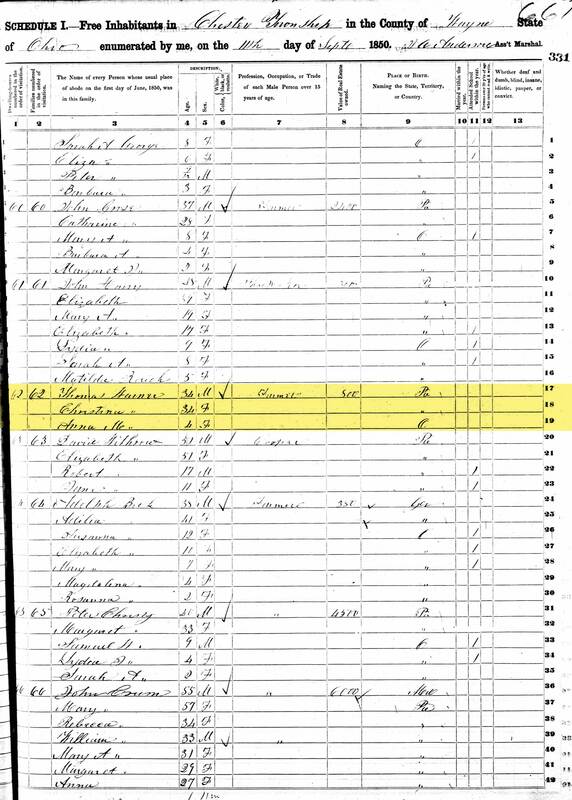 6 1840 United States Federal Census about Thomas Warner; Year: 1840; Census Place: Green, Wayne, Ohio; Roll: 432; Page: 152; Image: 310; Family History Library Film: 0020179. 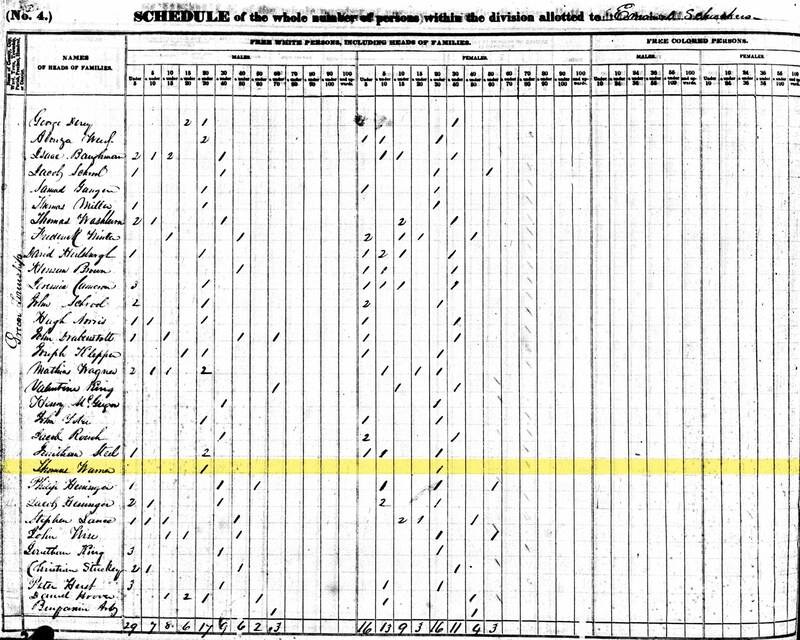 7 1850 United States Federal Census about Thomas Warner; Year: 1850; Census Place: Chester, Wayne, Ohio; Roll: M432_740; Page: 331A; Image: 223. 8 1870 United States Federal Census about Thomas Warner; Year: 1870; Census Place: Chester, Wayne, Ohio; Roll: M593_1280; Page: 55B; Image: 115; Family History Library Film: 552779.